From Thanksgiving to New Year, it’s a moveable feast of sumptuous proportions, one that demands wines that can cut through the rich foods yet flatter a cornucopia of flavors and textures. The wines of Alsace are a perfect fit, elegant, distinctive, and complex, with crisp acidity, rich texture, and balanced alcohol. Alsace, located in northeastern France, has a blended culture, resulting from hundreds of years of changing hands between neighboring Germany and France. Shaped by both German and French influences, Alsace wines are unique; fragrant, mostly white, single grape varietals in tall, tapered green bottles. The wines reflect the mosaic of soils and climate of the region. The Vosges Mountains protects Alsace from fierce Atlantic storms, so the vineyards enjoy an unusually sunny, dry climate, allowing the grapes a long hang time. This gives the wines ripe fruit flavors, and the cool nights ensure refreshing acidity. Alsace produces a lot of white wine, from Pinot Blanc, Gewurztraminer, Pinot Gris, Muscat, Sylvaner, and Riesling, aromatic with brilliant acidity, and not a bit of oak aging. Floral, with stone fruit flavors, and richly textured, these wines are fabulous food companions, and many carry enough weight to pair with richer dishes, like pork and roast fowl. And when a label states that a wine is a particular varietal, such as Riesling, you can be assured it’s 100%, since Alsace AOC regulations require it. Four styles are produced, sparkling Crémant d’Alsace (white and rosé), Alsace and Grand Cru AOC (still white and red wines), Vendange Tardive (late harvest concentrated wines with varying levels of sweetness), and Sélection de Grains Nobles (sweet wines touched by botrytis). The Wines of Alsace came to Los Angeles, presenting Alsace Wine + Swine, an introduction to how fabulous these wines are, especially with food. Alsace is famous for its cuisine, home to one of the highest concentrations of Michelin-starred restaurants in France, and pork is the star of the table. With seminars and a grand tasting at Terrine, wine professionals swooned over the quality, intensity and balance. Here are some of my highlights, for the holidays or anytime, overall, all were delicious and well-priced. Crémant d’Alsace, made like Champagne, can be Brut, Blanc de Blancs, or Rosé, a festive aperitif or a bubbly dinner companion. These are very nice wines which retail for a fraction of the price of Champagne. The non-vintage Rosé versions are especially good with food, made from 100% Pinot Noir. 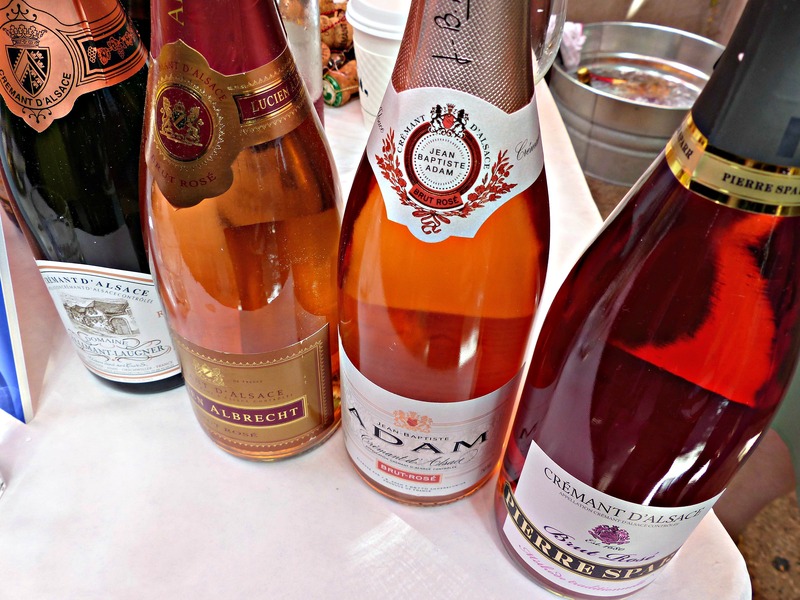 Some outstanding examples are Allimant-Laugner, Lucien Albrecht, Jean-Baptiste Adam, and Pierre Sparr Crémant d’Alsace Brut Rosé, all offer a fresh wine with rounder texture and richer body. As far as Brut, Pfister has a nice non-vintage Blanc de Blancs, while vintage Crémants are a step up, the 2012 Dirler-Cadé and 2011 Vignoble des 2 Lunes Blanc de Blancs Comete are excellent choices. Pinot Blanc is a fresh, lightweight wine, with a bit of smokiness to them, and a great drinking value. Good Pinot Blanc choices from the 2013 vintage are Kuentz-Bas Tradition, Charles Sparr, and Dopff & Irion, all retailing under $16. An interesting wine, Pinot Gris, is round and expressive, with a touch of sweetness that is balanced by a kick of acid, making it still dry on the palate, not so aromatic as smoky and exotic tasting. Some excellent examples are the 2013 Helfrich, the 2012 Emile Beyer Cuvée de L’Hostellerie, the 2011 Florian Beck-Hartweg Cuvée Prestige, the 2012 Dirler-Cadé Grand Cru Kessler, the 2011 Rieflé Grand Cru Steinert, and the stunning 2010 Schoffit Grand Cru Rangen de Thann Clos Saint Theobald. Gewurztraminer is full-bodied, with a fatness to it, usually off-dry, with a distinctive floral quality, a white wine to drink with heavier or spicy dishes. 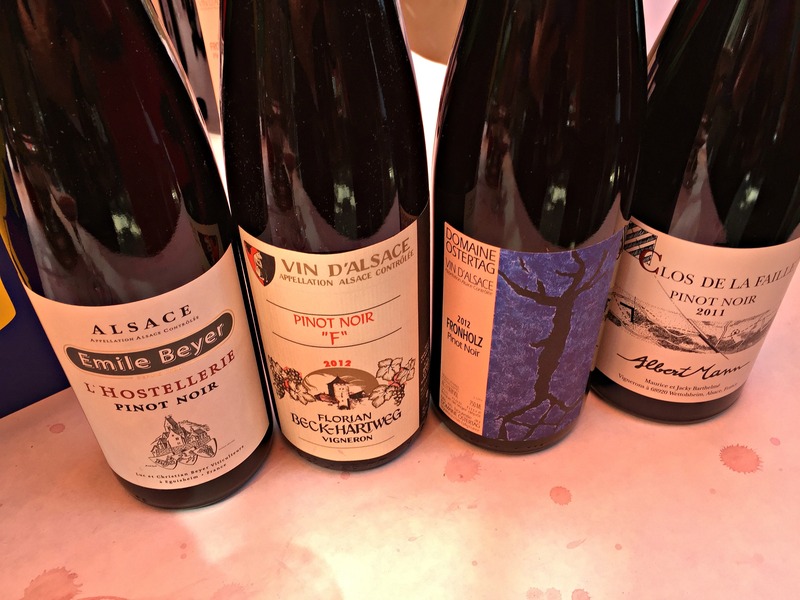 The only red wine that Alsace produces is Pinot Noir, a different and fascinating version of what you might expect from Pinot. More earthy, with a smoky quality, structure, and funk, in a good way, marks some of the best. Some good choices are the 2014 Domaines Schlumberge Les Princes Abbés, the 2012 Rieflé Bonheur Convivial, the 2012 Domaine Saint-Rémy Rosenberg, the 2012 Emile Beyer de L’Hostellerie, the 2012 Ostertag Fronholz, and the excellent 2011 Albert Mann Clos de La Faille, a biodynamic beauty! Riesling is the wine that most people flock to, with Alsace wines very different from the German version, certainly more dry when young. 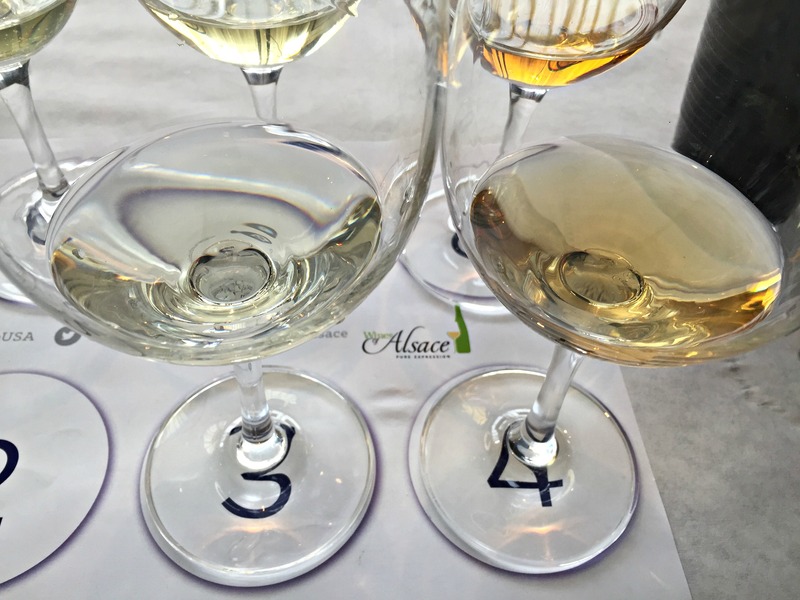 I attended the Rocks & Riesling Retrospective Seminar, led by Master Sommelier Brian McClintic, and was smitten with Alsace Riesling. These were mostly dry wines, in a variety of styles, from lean and racy to rich and powerful, a study of how soil types affects the ageability of the wines. Four renowned producers compared two of their single vineyard Rieslings, one young and fresh, the other with the patina of time, it was the holy smokes moment! From Trimbach’s limestone, Weinbach’s granite, Domaines Schlumberger’s blend of marl, limestone, and sandstone, and Zind-Humbrect’s volcanic soils, it was fascinating to see some commonality, like the floral, apple and lime, flint or petrol on the nose, and the high acidity and structure. And with age, these Rieslings became rich and round, opulent with honeyed aromas, textured body, a more pronounced petrol note, and a finish that went on forever. But differences did reveal themselves, below are my expanded tasting notes. The Trimbach 2009 Riesling, from the 80-year-old Clos Ste Hune vineyard, was floral, intensely aromatic with a hint of flint on the nose, an elegant, crisp, saline wine with a very long finish. Compared to the 1997 version, which was rich and round, this wine expressed honeyed aromas and a petrol nose, mineral and leesy, that lingered and lasted for a long time. The biodynamic Weinbach 2014 Grand Cru Schlossberg Cuvée Sainte Catherine was ripe, balanced, and structured, with a honeyed nose, yet had high acidity, a stony quality and iron character that reflected the cool vintage. It was compared to the warm vintage of 1998, which was an intense, rich and honeyed wine, elegant and well-structured, with a touch of botrytis, giving it a sensation of nectar. The Domaines Schlumberger 2012 Grand Cru Saering was lighter in body, aromatic and fresh with apple and lime, and a hint of petrol on the nose. Juxtaposed to the 2001, which was slightly richer and more textured, the honey, mineral, and petrol notes evident on the extra long finish. The Zind-Humbrecht 2013 Grand Cru Rangen de Thann Clos Saint Urbain was electric, a reflection of the volcanic soils from where it sprang. Racy and lean, it had a pure, distinctive nose, with a smoky iodine quality, and a pungent creme brulée palate. What a difference twenty years made, with the 1993 version, a smooth, complex wine, with a honeyed nose, a nuttiness alongside the full bloom of botrytis, balanced with lots of acidity that played out on the super long finish. These wines represent the best of Alsace, with Trimbach and Zind-Humbrecht at the higher end price-wise, and the aged bottles the most expensive, special occasion wines certainly worth the splurge! Alsace wines captivate with their intense perfume, refreshing acidity, and balanced structure, with Riesling and Pinot Gris growing more complex with time. Any of these wines will be a welcome companion to your holiday festivities, by the glass or with food, and provide great value for their quality.